Scripture is clear that Jesus did not sin and that He can sympathize with our weaknesses. According to the traditional doctrine, Jesus wasn’t even capable of sinning because He is fully God. But if He wasn’t even capable of sinning, what is the significance of His temptations and sinlessness? What does it mean for Jesus to be able to sympathize with us, as Hebrews 4 states, if He never sinned like us? What is the point of tempting Jesus if He can’t sin in the first place? If one can be tempted, doesn’t that presuppose the ability to sin? Give this some thought, and let us know what you think. We’ll hear Brett’s response on Thursday. Wasn’t He also fully human as well? My understanding, and please correct me if I am mistaken, is that God cannot sin. Jesus, being fully God and fully human, could sin as we do becuase we are human. He bled, and diead as humans do, but He rose from the grave becuase He is God. In my limited knowledge, because He was fullly human he could sin. But, He was able to resist sin much better than we are able becuase of his complete Holiness. He was an example to us…to show we CAN resist temptation as He did IF we believe. Understanding this comes from recognizing the difference between where temptation originates, and where sin originates. Temptation is caused by the enemy, a source outside of us pushing upon us. Sin comes from within, from the heart. The fact that Jesus was not capable of sin is originated in who he is. The fact that he was tempted is originated in who Satan is. The ability of Christ to remain sinless does not negate the character of Satan, who will tempt and accuse. In reverse, the fact that Satan behaves within his character does not negate the character of Christ and his ability to remain sinless. Satan tempting Christ shows us that he will behave within his character, no matter who the target of his attack is. We ought not be surprised when he attacks us, for he never behaved otherwise. It also shows us that Christ is capable of thwarting the attack of the enemy, and so in Christ we know we can do that same, by the same method. Even in temptation Christ behaved within his character, showing us that his character is consistent and unchanging. I would say that since he was fully God and Fully man, having two natures. His fully man nature would be able to be tempted and would be capable of sin. I have to believe his God nature helped the man nature to not sin, but that he was capable of sin. His God nature would not have been capable of sin though. Now since his God nature and human nature inhabited the same body, is it possible that hypothetically his human nature could sin, but that his God nature could not allow that to happen? Another thing to think about is what if His man nature did sin, would his God nature automatically leave the body? This could really get confusing! The flesh is weak and most definitley can be tempted. Satan did not use the tactic of temptation when he tried to become greater than Him rather, he flat out tried to overthrow Him. However, the flesh IS weak and since God was in flesh as Jesus Christ that was satan’s ‘windoow of opportunity’ so to speak. Lucifer trying to take out God head on did not work…..so he tried what he is best at. Lies and deception……that didn’t work either. God made Himself vulnerable for us by becoming human in Jesus Christ. During those 40 days, Jesus became hungry and weak just as we do. Showing without a doubt he was indeed fully human as he also did in His death on the cross. So in my estimation, He could also be tempted. Even though Jesus was weak due to the flesh being deprived of what it needs to survive, He drew the strength He needed through the Word of the Father to resist the temptation. Doesn’t Scripture say Jesus was ‘without sin’ and not He ‘could not sin’? The Bible does not say He could not sin, it says He did not sin. Jesus was fully man, God in the flesh, He could have sinned but He chose to embrace His holiness full time. So there’s a logical possibility that He could have sinned? If He sinned, He would have ceased to be God. Is it possible for God to cease being God? But at that time, God was also man. That’s where the opportunity for the temptation of sin comes in. If it we are talking about only God then yes. What do you mean by tempted? Do we mean tempted as in he was presented with an opportunity? If someone approached me with 100 bucks to buy some kid beer, the opportunity has been presented to me, yet I would turn the offer down and not think twice. So in this way, it was presented to me, and thus tempted. In the same way, Jesus was presented with the opportunity to worship Satan and receive certain benefits, but Jesus rejected it, and because it was presented to him, he was thus tempted. If, that’s what we mean by tempted. If we mean tempted, as in, we can feel the pull or weigh or attractiveness of a certain (sinful) thing, like wanting to give a girl a second look, or wanting to rule over the world if we only worship Satan, or having an abortion cuz you don’t want your parents to find out, then yeah, Jesus felt the pull, as does anybody, or the real weight that this temptation has on his flesh. Which brings up an important sub topic, the dual nature of Jesus, which is important. While they are two different natures, I don’t want to run the risk of separating the two far apart. They are still unified. So his human nature, or flesh, really felt the pull or the temptation, however, the God nature simply wouldn’t allow him to give into it. So no, temptation does not imply the ability to sin. Temptation just means temptation, the tug to do it, but Jesus being God wouldn’t give into that temptation. I’m going to nominate you for best answer. Yes he could have sinned, no he didn’t. God is far more interested in Holiness than he is in innocence, Holiness is simply innocence that’s been fully tested (tempted). Adam, Eve, you and I and everyone else have failed that holiness test at some point, Jesus didn’t (that’s why he’s considered Holy, from his human-nature perspective.). Also if he wasn’t capable of sin then why did Satan (the father of our human nature) bother to try and tempt him in the wilderness? As I said to Steve, if it’s possible for Jesus to sin, then it seems to say it’s possible for God to cease being God, which doesn’t make sense, since God’s sinlessness is essential to Him. Yes, I agree that He didn’t sin, but just the possibility may be what’s worrying the questioner. He was tempted but did not have the ability to give in. 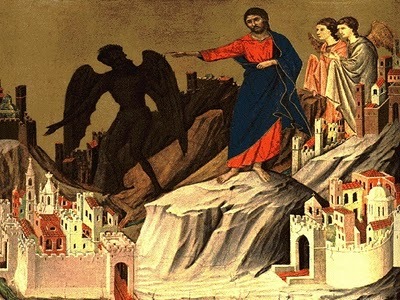 Luke 4 tells He was driven to the wilderness to be tempted by Satan. Jesus felt the pressure of temptation like we do. But remember, Jesus did not have that sinful nature that you and I have, so there was not that necessary element present for temptation to succeed. Jesus was tempted, but He was not vulnerable to it like you and I. Thank you to Greg Laurie for that. I have. A LOT to learn! And I am looking forward to the response from Brett. I agree with Adrian’s distinction between the difference senses in which somebody can be tempted. On the one hand, we’re told that we should not tempt the Lord. On the other hand, we’re told that the Lord can’t be tempted anyway. Surely, “being tempted” is used in the two different senses that Adrian is talking about. The Lord can be tempted in the sense that we can attempt to persuade him to do wrong. But the Lord cannot be tempted in the sense of being persuaded to do wrong. Bill Craig recently addressed this subject in one of his podcasts on the incarnation. His answer was that Jesus may not have known that he was incapable of sin, in which case he felt just as much anguish as anybody would feel who was tempted to do wrong but who wanted to do right. He reconciled Jesus’ lack of knowledge with his omnipotence by making analogies. One analogy is that although we have lots of information in our heads, we’re not always thinking about it. We can even choose not to access knowledge that we have. Jesus emptied himself when he took on humanity, and that emptying may have included not accessing (or forgetting) what he knows. We don’t cease to have knowledge when we forget things. Otherwise, we’d never be able to remember them. Here’s how I’d answer, though. Jesus’ inability to sin is due to a lack of inclination on his part. Jesus can’t sin because he has no sinful desires. All his desires are bent on living in perfect obedience to the Father. There is no opportunity Satan could present Jesus with that would be sufficient to overcome Jesus’ natural inclination to do the right thing. Clearly, that does not render the temptation events meaningless. It seems to me that it renders them meaningful. It is the condition of our hearts that causes us to sin (James 1:14-15, Luke 6:44-45). The condition of Jesus’ heart prevents him from sinning. It’s because of Jesus’ perfect goodness that no sinful temptation can prevail upon him. Obviously there’s merit in that. The fact that Jesus was tempted, yet didn’t sin, might mean that He knows the full power and anguish of temptation more than we do, since we usually find ourselves giving in to quickly and easily.